Nancy Rosen was born in Chicago and except for her four years at the Kansas City Art Institute where she earned a BFA in painting and sculpture this is where she has remained. 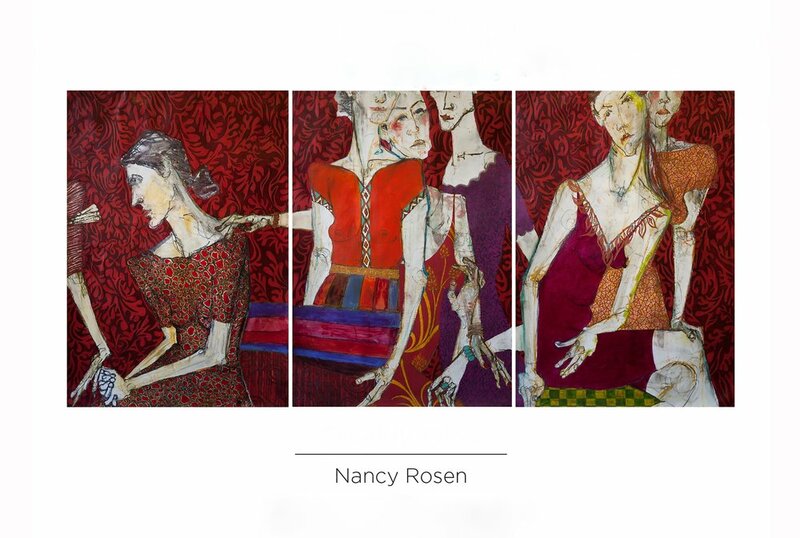 During that time Nancy has devoted her life to painting exhibiting and teaching. Nancy has shown her work in galleries and exhibits across the country. Nancy’s painting are a bit difficult to categorize due to the unique use of mixed media and surfaces, but most are figurative. She combine oil bars, china markers, graphite, oil paint on a variety of surfaces including gessoed paper, pieced and hand made exotic papers, linen and rice paper. The pieces feature infinite detail and layers, textures and colors. Nancy has shown in a variety of settings including numerous solo shows, venues include Kansas City Art Coalition, Elmhurst Museum, Milliken University, The Post Family and the Illinois Art Institute and her work has appeared in movies and tv - most recently in the Netflix series Grace and Frankie where her work is shown as Lily Tomlin’s paintings. I am a painter. For me this does not require much thinking, it is more like breathing. Whatever you you see in my painting is your own reflection, like a mirror. To me it is simple, instinctive and essential.Over the last few years, I’ve been creating art for Frankie played by Lily Tomlin in the Netflix series Grace and Frankie.